My Skin is going NUTS right now: Rosacea or Acne?? About two weeks ago, my face started breaking out with little tiny whiteheads. I would wake up to find 10 on my chin, and now it's gotten worst. I wake up to about 30 tiny white pus-filled pimples on my face everyday. Yes, gross, I KNOW! (I haven't changed any facial cleaners, makeup, detergent, hairspray, etc). My husband also noticed that my neck and chest constantly looked red and sunburned. I went to my primary care doctor who said it was probably a bacterial acne, and he prescribed Tetracyclicne antibiotics. But they gave me heart palpitations/flutters, so I only took them for 4 days. I am not sure if I have adult acne (maybe hormonal), Rosacea, or an allergic rash! I have been searching online to self-dx but can't seem to find an exact answer. (And I can't see dermatologist for another two weeks!) I did get some relief from Hydro-Cortisone cream over the weekend, but I know I can't use that long term, so this morning I ran to Whole Foods and found this great homeopathic cream, derma e's Tea Tree and E Antiseptic Creme. Immediately out of the store, I put some on my chest and neck...and WOW, it's so soothing and my skin is looking better already. The only downside is that for the first few minutes, I smelled like a medicine chest (ha). Anyhow, I am pleased to find something "natural" and sure hope it continues to give me relief! 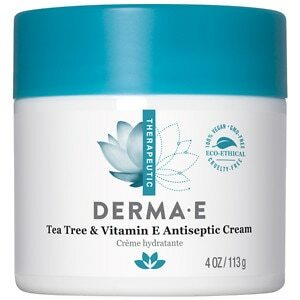 I had not heard of this brand (Derma e) but definitely plan to buy more of their products.